This 500-piece jigsaw is designed by Kemon Sermos and measures 18" x 24". 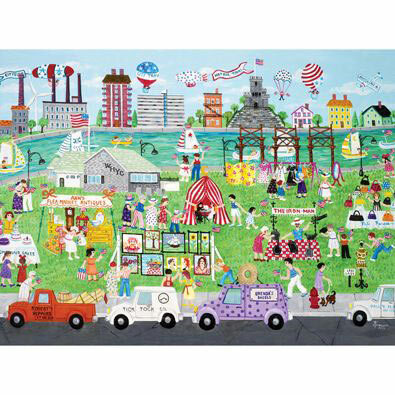 This puzzle depicts a colorful market in the park of a busy city. The autumn sun rises on this cottage by a lake, as a solider returns home. Available in two piece counts. This 500-piece jigsaw is designed by Kemon Sermos and measures 18" x 24". This puzzle depicts a scene from a barnyard yard sale. • This jigsaw puzzle is made of recycled cardboard. Available in two piece counts. This 500-piece jigsaw is designed by Kemon Sermos and measures 18" x 24". Everyone has gathered to this frozen pond to skate to their hearts content. Available in two piece counts. This 500-piece jigsaw is designed by Kemon Sermos and measures 18" x 24". This small sea-side town celebrates a snowy Christmas. Available in two piece counts. This 500-piece jigsaw is designed by Kemon Sermos and measures 18" x 24". This puzzle depicts a busy city full of people moving in and moving around!Available in two piece counts. This 500-piece jigsaw is designed by Kemon Sermos and measures 18" x 24 The children are hard at work getting their house ready for Christmas in this colorful scene. Available in two piece counts.